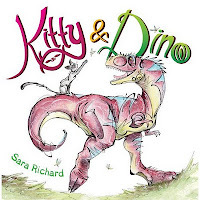 Sara Richard's Blog: Kitty & Dino for Preorder online! Kitty & Dino for Preorder online! Link! It's published through Yen Press, and I'm REALLY excited for it's release on April 9th! Hardcover and 48 pages of super swirly fun! Also if you preorder it, it's a lot cheaper than when it comes out in stores. So if you have a kidlet, or an inner child, no matter what age (there's not a lot of dialogue, very image driven) please pick up the book! I'll hopefully have some at shows and when you get yours later on I'll be happy to draw in it if you see me at a convention! If anyone knows how to pitch these to libraries to pick up please lemme know. haha so much to learn!